By Donavan Leonard: “Ducking”. Quite possibly the most overused verb in the lexicon of boxing fans (in a tight race with “exposed”). Originally attributed to a champion, who overtly avoided the consensus most potent challenger, it is now used to describe a fighter who does not fight who his detractors believe he should, when he should, according to the terms that the detractors desire. Does this practice happen? Of course it does. Gennady Golovkin was avoided by Sergio Martinez, Miguel Cotto, and then Canelo Alvarez for two years when he was perceived as the beast of the middleweight division. Guillermo Rigondeaux was a pound for pound performer at super bantamweight for seven years with name fighters such as Carl Frampton, Leo Santa Cruz, and Scott Quigg never giving him the opportunity to share a ring with them. The real culprit behind these fights never happening? Economics. Schedules for fighters are for advancing earnings, not determining who is the best pugilist. There are times when these paths cross, with examples in recent years of Golovkin-Alvarez, Sergey Kovalev-Andre Ward, Oleksandr Usyk-Murat Gassiev, and Terence Crawford-Julius Indongo. Those too-infrequent moments are when the sport is at its best and the fans can hold their heads the highest. 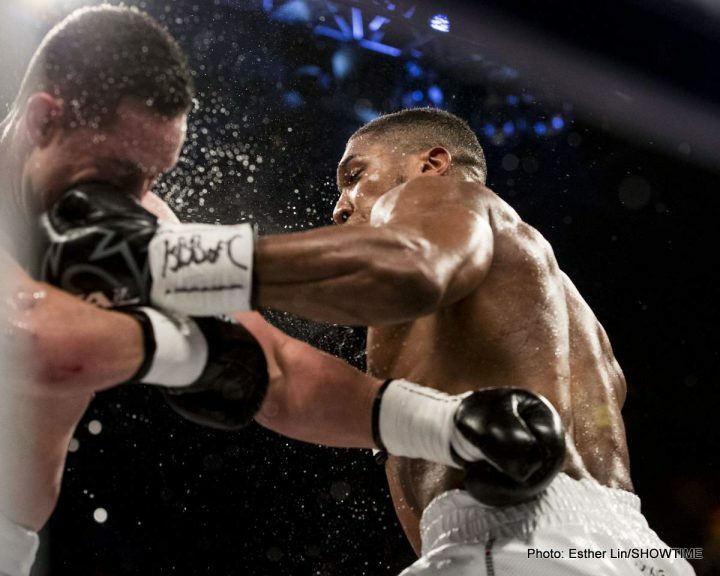 What can me made of the quagmire in the heavyweight division? It seems to go against the argument of economics. In any permutation of bouts between Anthony Joshua, Tyson Fury, and Deontay Wilder, the combatants stand to both determine which fighter is the best (and baddest man on the planet) and make the highest purses of their respective careers. The answer is simple. They are ducking. Ask any Wilder fan and Joshua is ducking him by not giving him 50/50 and fighting in the United States where all champions must prove themselves. Ask any Joshua fan, and the converse is true, but only because Wilder doesn’t want to accept the fact that he is a ‘B-side’ fighter who should appreciate and accept the career-high purses being offered. Of course, Joshua is also ducking Fury, according to his fans. Fortunately Wilder and Fury are rumored to be fighting again in May 2019, so that will eliminate one of the opponents from Joshua’s ‘duck list’. Then again…Joshua is ducking Dillian Whyte, as is Wilder, who has been ducking Dominic Breazeale for a shameful two years. The evidence for all of these ducks can be traced to a quote by a promoter, unnamed source in a tabloid, or an article on the internet. Boxing fans, the ones who do not sling mud on boxing sites, know better. There are many variables that have to be weighed. The “battle for the battle”–the nuances of negotiation– has been ongoing and will continue to be fought long before the combatants place their signature on a contract. Where would the fight take place? Traditionally Las Vegas brings the most money to the table, but neither fighter has fought in Vegas. Joshua has shown to be a tremendous draw in the UK. Should his gold medal and ability to make an ‘event’ (80K plus in attendance each of his last three bouts) be secondary to the potential money that can be made by casino site fees and fighting in his opponent’s home country? Would Wilder be willing to travel across the pond to England? What does each side truly bring to the table? Golovkin had only 170K PPV buys vs Daniel Jacobs and Alvarez had 300K versus Liam Smith. However, the sum of their parts resulted in three times the combined buys (1.3 million) for their showdown in 2017. Would that multiplier translate for Joshua and Wilder? Would this even be on PPV, or would Joshua’s manager Eddie Hearn adhere to the ‘PPV is dead’ mantra that was bravely touted with the signing of Alvarez? Would the DAZN model be able to support such a bout? What split is right? Two bouts ago, Wilder was making $2.1M against Luis Ortiz. Joshua was paying more than that in taxes from his purses with Parker ($25M). With a reputed $12M-$14M earned from his bout with Fury, Wilder might have proven to be, like Golovkin, the type of opponent who can help the more popular fighter earn the most money. Without seeing the actual contracts, offers to Wilder have been purported to range from a flat fee of $15M to as high as a 60-40 split, with Joshua getting the higher percentage. Better fighters than Wilder have taken lower percentages to get a chance to fight for the title (such as Evander Holyfield taking $11M to Mike Tyson’s $22M in their first bout, a 33% split). Golovkin held out for what he wanted versus Alvarez for the second bout. Will Wilder’s persistence be rewarded? Most importantly–where does this fight get televised? Joshua is DAZN. Wilder is PBC (Showtime/Fox). Who would get the rights? Is it DAZN subscription or Showtime PPV? Perhaps some of this could be settled once the location of the bout is determined, as DAZN is available in the U.S, but the bouts are PPV in the UK (for a smaller fee than is charged in the US). Regardless, both fighters are cornerstones of their respective broadcast alliances, and concessions would have to be made for either broadcaster to give up the rights to show their star. This will be a huge win for whoever gets the rights, and the biggest bone of contention among the parties. As has been shown, there is much more to making Joshua-Wilder than for them to just ‘quit ducking each other.’ There are battles on several fronts that need to be addressed to the satisfaction of the parties involved. The hope is that whoever is victorious in the pairings of Joshua-Jarrell Miller and Fury-Wilder will quickly iron out the differences and provide the sporting world with “one champion, one face, one name” before the end of 2019.